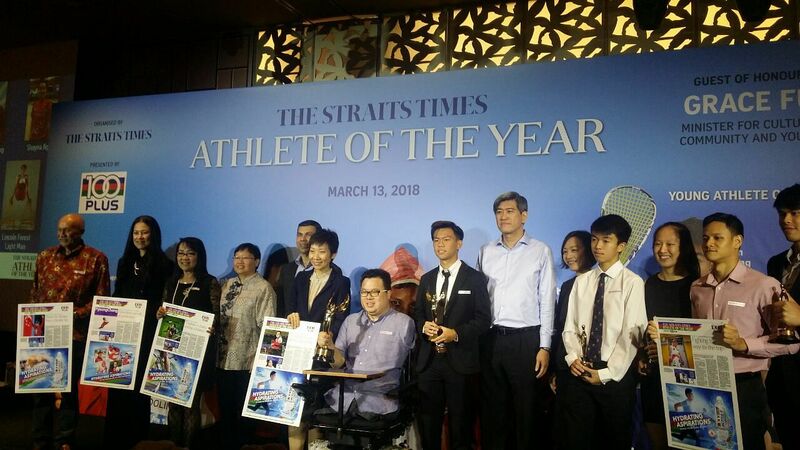 Table tennis player Jason Chee, who overcame the odds to win a gold medal at last year's Asean Para Games, was named The Straits Times' Athlete of the Year 2017. SINGAPORE - Gritty table tennis player Jason Chee, who won a gold medal in the men's singles Class 2 event at last year's Asean Para Games just four months after losing his right eye to cancer, was named The Straits Times' Athlete of the Year 2017 on Tuesday (March 13). Chee was nominated alongside Muhamad Ridhwan (boxing), Cheyenne Goh (winter sports), Shayna Ng (bowling) and last year's winner Joseph Schooling (swimming) for the prestigious annual award, which is the only honour that recognises both able-bodied and disabled athletes. This year also saw the introduction of a new accolade - the ST Young Athlete of the Year award - which was won by former Meridian Junior College (MJC) footballer Justin Hui. Both awards are backed by F&N's 100Plus. Other past winners are swimmer Quah Ting Wen (2009), the national women's table tennis team (2010), badminton player Fu Mingtian (2011), para equestrienne Laurentia Tan (2012), footballer Safuwan Baharudin (2013), swimmer Joseph Schooling (2014, 2016) and para swimmer Yip Pin Xiu (2015). ST sports editor Lee Yulin, who headed a nine-member judging panel for the 2017 award, said: "This was a strong cohort of nominees but when one considers the power of inspiration, which is a key element of this award, then that makes Jason the obvious choice."